A special fund-raising gala ball is being held in memory of little Mark Gilmore who passed away almost 20 years ago after a battle with leukaemia. 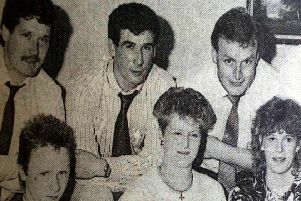 Speaking to the Times in November, Eric Gilmore said the loss of his brother is still with him to this day and so, with cousins Gary Gilmore and Fiona Beggs, he wanted to pay a special tribute to the youngster by raising vital funds for Leukaemia and Lymphoma NI. And the centrepiece of a year long series of events to boost the charity’s coffers will be a formal ‘gala ball’ at Ballymena’s Tullyglass House Hotel on Friday, August 28. Eric explains: “Mark was diagnosed with leukaemia in December 1989 and went through a number of years of treatment during which he was very brave and touched everyone who knew him. Attempts were made to find a bone marrow donor to match with him but this proved impossible and he passed away on July 2 1995. The Gala Ball will be formal dress and tickets are £35 per person and can be obtained by contacting Eric on 07834988501 or Gary on 07749959510.